This autumn, Sharjah Art Foundation presents a landmark retrospective of the work of pioneering conceptual artist Hassan Sharif, marking the largest and most comprehensive survey of the Emirati artist's work to date. Sharjah Art Foundation President and Director Sheikha Hoor Al Qasimi and Abdulraheem Sharif during the exhibition preview of Hassan Sharif: I Am The Single Work Artist, 2017. Image courtesy of Sharjah Art Foundation. This autumn, Sharjah Art Foundation presents a landmark retrospective of the work of pioneering conceptual artist Hassan Sharif, marking the largest and most comprehensive survey of the Emirati artist's work to date. On view from 4 November 2017 to 3 February 2018, Hassan Sharif: I Am The Single Work Artist traces nearly five decades of the artist's multimedia practice, including painting, sculpture, assemblage, drawing, installation and photography. Some never-before-seen works and the entirety of Sharif's studio—recently donated to SAF by the artist's estate—will also be on view, providing new perspective on the artist's practice. Curated by Sharjah Art Foundation President and Director Sheikha Hoor Al Qasimi, Hassan Sharif: I Am The Single Work Artist is the culmination of the artist’s lifelong role as an advocate and pioneer for the development of contemporary art and thought in the United Arab Emirates, and especially in Sharjah, where he first began staging interventions and exhibitions of contemporary art. I Am The Single Work Artist is organised thematically and follows the development of Sharif’s conceptual art practice from 1973 to 2016, highlighting his unprecedented influence through key series of works he revisited throughout his life. These works illustrate his enduring social and philosophical reflections on mathematical systems, time and the banality of the everyday. Some of the earliest works presented in the exhibition are Sharif’s newspaper caricatures and comic strips of the 1970s, which predate his radical shift towards experimentation and conceptualism. They reveal his prevailing interest in the rapid industrialisation and globalisation of the United Arab Emirates. The exhibition also features what are perhaps his best-known works – his ‘weaving’ series of assemblages and ‘urban archaeology objects’, which were created from inexpensive and mass-produced consumer materials and, for Sharif, represented the transformation of industrial excess into art. In addition, Sharif’s ‘semi-systems’ of the 1980s, also included, reveal the artist’s fascination with constructing intricate systems and methodologies. Often taking the form of drawings, these works illustrate playful procedures and rules of repetition developed by the artist, which are carried out on paper and result in geometric shapes and forms. Free and open to the public, the retrospective exhibition will span all of Sharjah Art Foundation’s spaces in the Al Mureijah Square area and Bait Al Serkal in Arts Square. SAF will also publish a comprehensive bilingual (Arabic/English) catalogue, including essays by the artist, Sheikha Hoor Al Qasimi, Emirati artist Mohammed Kazem and Emirati poet Rashid al-Khalid. Following its presentation in Sharjah, the exhibition Hassan Sharif: I Am The Single Work Artist will travel to partner venues internationally. Sharjah Art Foundation is an advocate, catalyst and producer of contemporary art within the Emirate of Sharjah and the surrounding region, in dialogue with the international arts community. Under the leadership of founder Hoor Al Qasimi, a curator and artist, the foundation advances an experimental and wide-ranging programmatic model that supports the production and presentation of contemporary art, preserves and celebrates the distinct culture of the region and encourages a shared understanding of the transformational role of art. The foundation’s core initiatives include the long-running Sharjah Biennial, featuring contemporary artists from around the world; the annual March Meeting, a convening of international arts professionals and artists; grants and residencies for artists, curators and cultural producers; ambitious and experimental commissions and a range of travelling exhibitions and scholarly publications. 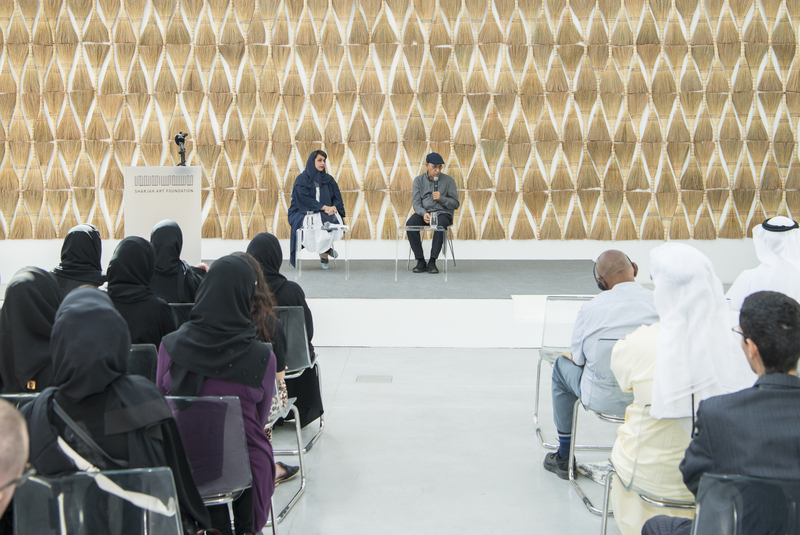 Established in 2009 to expand programmes beyond the Sharjah Biennial, which launched in 1993, the foundation is a critical resource for artists and cultural organisations in the Gulf and a conduit for local, regional and international developments in contemporary art. The foundation’s deep commitment to developing and sustaining the cultural life and heritage of Sharjah is reflected through year-round exhibitions, performances, screenings and educational programmes in the city of Sharjah and across the Emirate, often hosted in historic buildings that have been repurposed as cultural and community centres. A growing collection reflects the foundation’s support of contemporary artists in the realisation of new work and its recognition of the contributions made by pioneering modern artists from the region and around the world. Sharjah Art Foundation is a legally independent public body established by Emiri Decree and supported by government funding, grants from national and international non-profits and cultural organisations, corporate sponsors and individual patrons. All events are free and open to the public.